Is Amazon Premium A+ Content a Good Idea for Your Brand? Has Amazon offered your brand the chance to buy Premium A+ content for your product pages? Or have you been wondering if you should begin pulling together assets for the day the opportunity is opened to you? If so, you may be wondering whether the new features are worth the price tag. We’ve pulled together some information about Amazon Premium A+ you will want to consider before making your decision, from the difference between standard A+ pages and Premium to what you will need to get started. What is Amazon Premium A+? Amazon Premium A+ content is similar to standard A+ content in its placement and general idea, but it relies much more heavily on visual appeal and offers more interactive options. Although it depends on the page, the content generally sits a few widgets below the “above the fold” content, following the “Frequently Bought Together” and “Customers who bought this item also bought” widgets. It is comprised of modules that are stacked together, the same way standard A+ is built. However, Premium A+ allows for seven modules while standard A+ is limited to five modules. While Amazon has not made conversion info available for Premium A+ pages, the company reports that brands can expect up to 15% increase in sales from standard A+ content. Premium A+ is reserved for vendors and currently only available by invitation. How are Premium A+ Pages Different from Standard A+ Pages? Amazon Premium A+ modules have spots for full images that maximize more space on the page and appear more ad-like. The typical sizes are 800 x 600 or 1464 x 600, allowing for images that stretch across the whole Amazon page. Standard A+ pages have much smaller images as the content does not stretch as wide. The widest module for standard A+ content is 930 pixels wide. While standard A+ content does not have a space for video in the content, Premium A+ offers a full-screen video module or one that can play alongside text. It should be noted that pages with standard A+ or even no A+ can still load videos to the product image carousel at the top of the page. With very short character limits for titles and paragraphs alike, there is not much space for descriptive text. For some types of products, this will work just fine, as the more visual feel will be enough. For others, this may make it difficult to get across enough information to satisfy consumers’ concerns about buying. Depending on the module, a typical paragraph has a maximum character limit between 100-500, which is roughly 4-5 sentences. No modules offer bullets, and only three line breaks are allowed in most paragraph fields. Additionally, the more text you want to include, the more images and videos you will need to have prepared to accompany it. All Premium A+ modules have clearly been designed to look great on mobile devices. They use the provided images and scale to the correct size while re-organizing the content to fit smoothly into the smaller screen. Interactive modules adjust so consumers can still interact with the content on small devices. Most standard A+ modules adapt in some way to mobile (although the comparison chart does not). 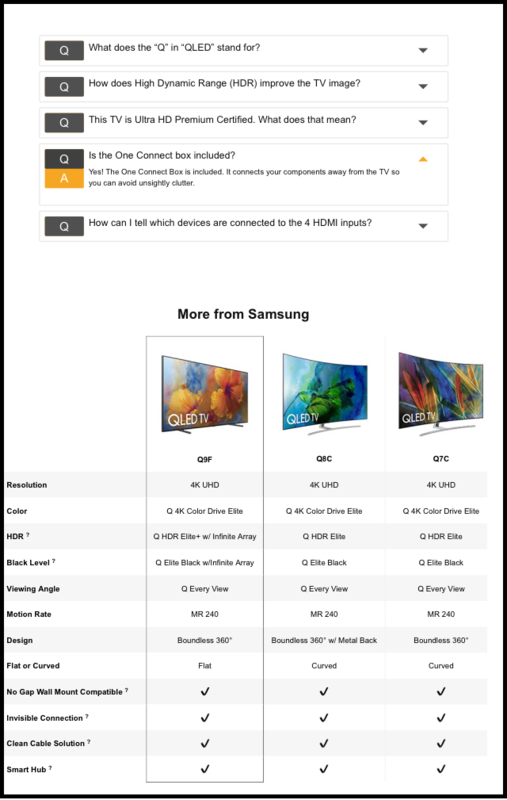 In this mobile screenshot, the Q&A still allows consumers to click and the comparison chart scrolls the TVs to the right to compare with the selected TV. As the future trends toward voice-enabled devices, such as those with Amazon’s Alexa system, shorter text snippets will become more user-friendly. Premium A+ content fits nicely into this vocal world because it will not require devices to read as much content out loud. If Premium A+ pages sound like they would work well for your brand, you will also need to consider whether you have the resources to make the most of your new pages. Here are a few things you will need. In addition to the fee charged by Amazon, creating Premium pages may come with some additional costs for creation and assets. Their need for incredibly robust imagery and the available additional features may mean a higher bill if you do not already have a full complement of visuals and content ready to go. Whether they are new or existing, you will need those large, high-quality images to support the Premium modules. Currently, no field may be left blank, meaning you must have as many images and text descriptions as the modules you pick allow. We recommend that brands have at least 5 large images to make a decent Premium page. This would not include things like logos or icons, which would not work well filling the space. Product-related videos can stand in for some of these images. Since Premium A+ pages are in their infancy, there are still some glitches that we expect will be worked out over the coming months. If you are ready to pull the trigger now, you can expect a few hiccups as you get rolling with the initial pages. Want to get in touch about creating Premium A+ content?